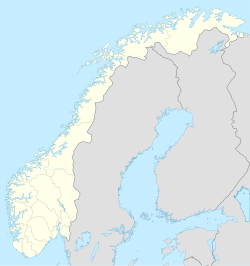 Hervik is a village in Tysvær municipality in Rogaland county, Norway. The village is located on the western shore of the Herviksfjorden, about 6 kilometres (3.7 mi) east of the village of Tysværvåg and about 8 kilometres (5.0 mi) northeast of the Kårstø industrial site. The village is known for production of fruit syrup, juice, and jam. Products are sold by mail order, at 7-Eleven and in delicatessens nationwide in Norway. The village has been populated since around the 14th century and has grave sites dating from the Bronze Age. The name Hervik is etymologically connected to Harwich in England, Here-wic, which means a cove (vik in Norwegian) populated by an army (hær in Norwegian). In medieval sources the village is known as Heruicum. ^ "Hervik, Tysvær (Rogaland)" (in Norwegian). yr.no. Retrieved 2015-09-22.